﻿Since now my hair has been fully natural for about 3 years, I wanted to find products that are organic and good for my hair. 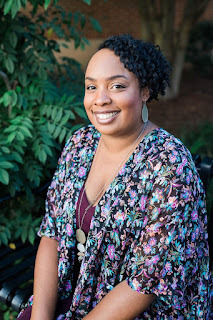 Reading different hair blogs helped me to understand the types of natural hair products that are out there for natural hair African American women. My hair can become very dry so I needed a product that would moisturize my hair and won't weigh it down. I remember taking a trip to my local Target (as I would call it Tarjay..lol!) to look at what type of moisturizers they had since I heard they've a good selection on organic hair care products for black hair. Contains de-ionized water, Butyrospermum Parkii (Shea butter), Macadamia Ternifolia seed oil, Mangifera Indica (mango) seed butter, Persea Gratissima (avocado) oil, Cocos Nucifera (coconut) oil, Aloe Barbadensis leaf extract, silk protein, Melia Azadirachta (Neem) seed oil, Daucus Carota Sativa (carrot) seed oil, Caprylyl glycol, Sorbitol Esters, essential oil blend, Lonicera Caprifolium (honeysuckle) flower and Lonicera Japonica (Japanese honeysuckle) flower extract and Tocopherol (vitamin E). I thought to myself, "These ingredients sound delicious! I want to dive my hand in and eat it!" Not only does it have great ingredients, but it smells wonderful too, like I'm smelling a tropical fruit! The product looks like a white creamy butter. So I purchased the round container of moisturizer heaven and went home and did a Google search about it. I've read nothing but good reviews about it ,so I gave it a try. I washed and dried my hair first, then added Organic Coconut & Hbiscus Curl Enhancing Smoothie to my hair. My hair was so soft and moisturized after using it! I knew I found my staple! My daughters are also natural and I use it on their hair as well. 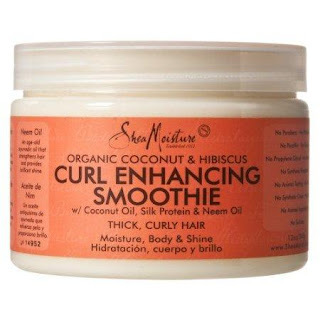 This product works great for twists outs, braid outs, or just a moisturizer when your hair is feeling dry. A little goes a long way. Whenever my hair is feeling a bit dry I put a quarter size of the smoothie in my hair. I would recommend this product for any looking for a product to do twists outs, braid outs, or need moisture to your hair.